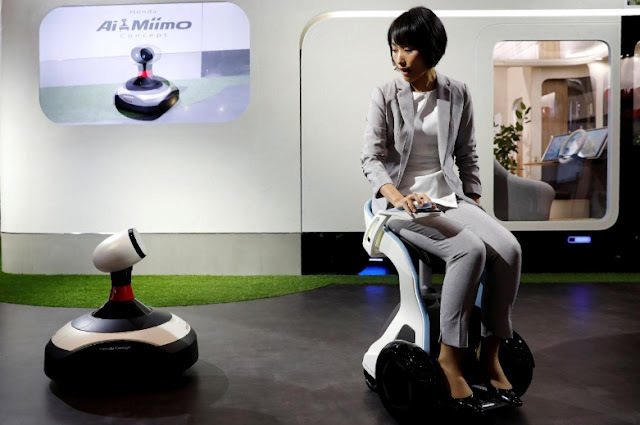 A model riding Honda ChairMobi Concept presents Ai-miimo, Honda's concept model of AI-installed lawn mower, during media preview of the 45th Tokyo Motor Show. TOKYO - Japanese automakers are finally embracing electric cars, showcasing concepts ranging from compact sportscars to all-wheel-drive mini SUVs at this week’s Tokyo Motor show, although they haven’t given up on alternative technologies. After years of investing in hydrogen fuel cells and electric-gasoline hybrids, Japanese manufacturers are talking up all-battery electric vehicles (EVs) at the annual gathering. Many are looking to catch up with global rivals amid rapidly tightening global emissions regulations and improving technology that may make EV batteries a price-competitive option to gasoline engines in the coming years. “As far as green cars go, vehicle powertrain electrification is a must,” said Soichiro Okudaira, president of Daihatsu Motor Co, a fully owned subsidiary of Toyota Motor Corp, which showed its concept of the “Pro Cargo” multi-use mini electric van at the show’s first media day on Wednesday . Even Toyota, the country’s largest automaker which set up an EV development team just a year ago, said pure EVs would be one of the “key solutions” for cleaner vehicles in the near future. Still, the maker of the Mirai fuel cell vehicle (FCV) is sticking to its view that the hydrogen fuel cell is the ultimate “green car” technology. Analysts say FCVs can refuel faster than an EV can recharge and can travel longer distances, making them a potentially attractive option for larger vehicles - though the cost and limited refuelling infrastructure pose challenges. Underlining its point, Toyota introduced two new FCVs at the show: the six-seater “Fine-Comfort Ride” concept car, and the “Sora” fuel-cell bus, which will be launched next year. Honda Motor Co on Wednesday announced it would launch a compact EV in Japan in 2020, following Nissan Motor Co, long a proponent of EVs and maker of the Leaf, the world’s best-selling battery electric car launched in 2010. As advances in lithium ion battery technology improve charging times and lower production costs, some automakers and suppliers expect increased demand will boost EV sales within the next decade, lowering their price towards gasoline vehicles. “We see this tipping point happening around 2025. By then for the customer to buy petrol or EV it will be practically same cost,” Nissan Executive Vice President Daniele Schillaci said. While global automakers acknowledge the internal combustion engine may become obsolete in the coming decades, smaller automaker Mazda Motor Corp continues to squeeze more efficiency out of gasoline engines, developing its spark-ignition compression engine which it says could improve fuel economy by as much as 30 percent. Others argue that reports of the death of the gasoline engine have been greatly exaggerated. “Many in the media appear to be saying that EVs are going to take over the world, but given ongoing technology and cost limitations, it will be difficult for that to happen anytime soon,” Subaru Corp CEO Yasuyuki Yoshinaga said. Japanese automakers are finally embracing electric cars, showcasing concepts ranging from compact sportscars to all-wheel-drive mini SUVs at this week’s Tokyo Motor show, although they haven’t given up on alternative technologies. After years of investing in hydrogen fuel cells and electric-gasoline hybrids, Japanese manufacturers are talking up all-battery electric vehicles (EVs) at the annual gathering.